Does it take you a long time to fall asleep at night? Is shift work or frequent traveling affecting the quality of your sleep? As more people seek out natural solutions to their sleep problems, melatonin has gained a lot of recognition for its sleep-inducing capabilities. But what is melatonin? And what effect does it have on our bodies and brains? Rather than acting as a sedative, melatonin tells your brain that night has fallen and it’s time to sleep. Melatonin is the main hormone synthesized and released by the pineal gland. Natural melatonin can likewise be found in a variety of food sources, including tomatoes, walnuts, cherries and dairy products. The release of melatonin is controlled by our biological clock which generates our circadian rhythms: our bodies’ natural day/night cycle. Stimulation from light during the day suppresses the release of melatonin, causing us to feel more alert and awake. Once the sun sets, decreased light stimulation causes your level of melatonin to start to rise. We reach maximum sleepiness when melatonin levels are at their highest, which occurs some time between 2 and 4 am. Our level of melatonin then gradually tapers off towards the morning, signaling that it’s time to wake up. 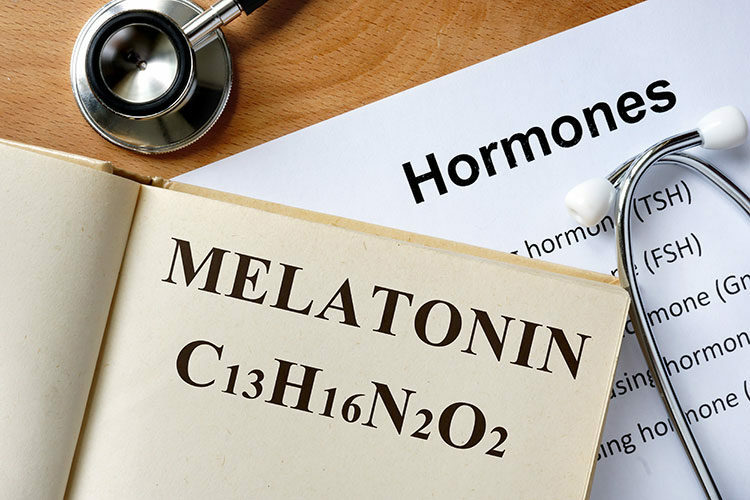 In addition to light, several other factors can influence our body’s release of melatonin, such as our behavioural patterns and certain medications. You should work with your natural melatonin, not against it by structuring your evening routine in a way which does not conflict with melatonin release. Use “night-mode” on smartphone if necessary. If you do watch TV, do so from a minimum of 6-feet away.​ Better avoid it altogether. A certain category of sleep disorders are caused by disruptions in circadian rhythms, which affects the release of melatonin. Understandably, when melatonin release is out-of-sync with our day-night schedule our sleep is negatively impacted. For instance, during the winter months when days are shorter we have less exposure to light and consequently melatonin may be released earlier or later in the day. These circadian rhythm disorders can be treated with light-therapy; or, alternatively, through the use of melatonin supplements. The lucid dreaming community touts melatonin supplements as a means to induce vivid dreams, and even facilitate lucid dreaming. This is likely due to a more rapid shift from REM sleep to state of waking, which causes us to remember dreams more easily. Alternatively, a phenomenon known as “REM rebound” may be the culprit: When you begin taking melatonin supplements your body begins to make up for lost sleep, spending more time in REM or having higher-quality periods of REM. It’s important to keep in mind that melatonin supplements contain an intrinsically different type of melatonin than that which is produced by the human brain. Now that you know what melatonin is and what role it plays in your sleep-wake schedule, you can make changes to your daily routine to help boost its effects.